11.0 – Turn R to cross a chain blocking vehicular access to a field. Just before the field go slightly to the R as the trail enters some woods. 22-A: Immediately on the left side of the trail, there is a chunk of very coarse-grained diabase. As you continue, there are sporadic smaller pieces. 22-B: To your right, there is a prominent low ridge that runs beside Ellerbe Creek. This is a levee. Natural levees are formed as the result of sediment deposited during flooding. When a river begins to flood, the water is moving rapidly and is therefore carrying much more and coarser sediment than during times of normal flow. When the water rises enough that it overtops the riverbanks, it no longer has the same force behind it, so the coarser sediment is deposited immediately, right next to the stream itself. Farther away from the stream, finer material settles out of suspension. Over time, a ridge of sandy sediment forms next to the stream, and silt and clay beyond that, in the floodplain. Natural levees are nature’s way of keeping the stream within its banks, but of course, from time to time severe floods happen, and they may breach the levees, or change the stream’s course. Humans may repair breaches in levees, fortify levees, and raise their height, in order to protect their property. 11.2 – Cross a small creek. 22-C: A little further along the trail, there is a breach in the levee. In addition, if you care to examine the levee here, you will see many huge fresh chunks of diabase. These could not have been deposited naturally, they were placed here in order to strengthen the levee. Also, their angular edges suggest they came from a quarry. 11.5 – Come out onto a wide powerline crossing. Stay slightly L to pass to the R of an orange marker and walk under the tower to start on a graveled road. 22-D: Near the tower, the gravel is composed of diabase. You may be able to see some dark and some light colored minerals. The dark minerals are pyroxene, olivine, and magnetite; the light ones are plagioclase feldspar. 11.6 – Soon, to the R of the next tower, turn R onto a path and quickly turn sharp L off of this as the trail reenters the woods. A view of Ellerbe Creek, R, awaits. Soon, the trail goes by the remains of a railroad trestle, R.
22-E: For the first part of this stretch, you walk along and on the levee. Before you reach the old trestle, you can see all the debris that has been swept into it and trapped during flooding. Note that it is all on the upstream side of the trestle (the side from which you approach it; Figure 22-E)). For the second part of this, you walk along an old roadbed parallel to the power line. 11.7 – Rock-hop a small creek. 11.9 – A view of Falls Lake is R, with a functioning trestle on the other side. This is near the mouth of Ellerbe Creek, or the point where it flows into the lake. Wherever a stream enters the lake, sediment is deposited and forms a delta. 12.3 – Start to walk within view of the railroad tracks and the lake, R. Soon cross a powerline. 22-F: Here you see a wide, flat expanse of lake. 12.4 – Pass by several abandoned buildings, L.
Now you are walking parallel to the railroad tracks. 12.6 – The footpath narrows to pass between 2 large trees. 12.8 – Ascend slightly to cross tracks of an old spur line and descend to walk along the edge of a field for a short distance. 22-G: Here, note the light-colored rocks piled in the gully to your right. They have probably been placed here in order to minimize erosion. Strangely, they came from a rock quarry in Raleigh, instead of two much closer ones in the Durham area, one just north along the railroad line. 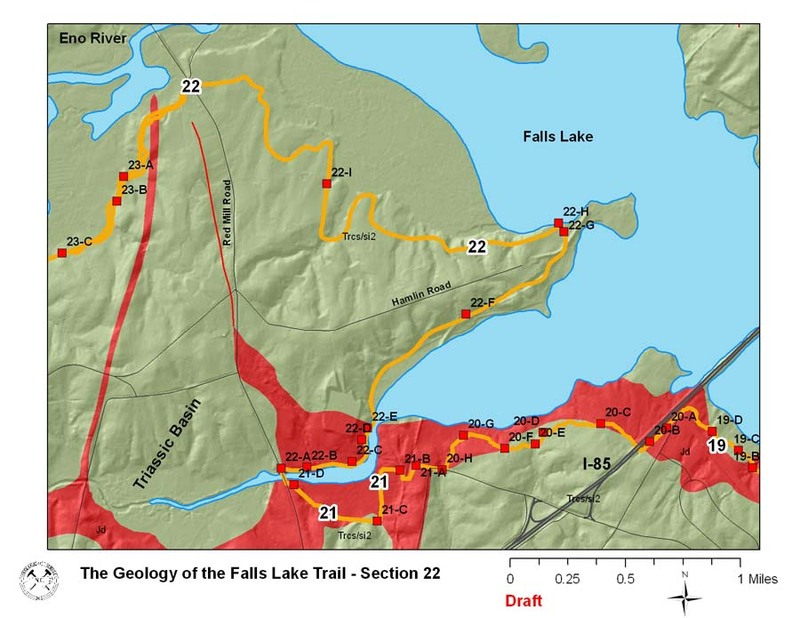 13.0 – Come out to a lake view, R.
22-H: Falls Lake is formed from the waters of several rivers: Ellerbe Creek, Eno River, Flat River, Little River, and Knap of Reeds Creek. This is the upper end of the lake where these rivers are emptying in to it (Figure 22-H). Most rivers have narrow and steeper channels in their upstream portions, and broaden and flatten downstream. In the area of Falls Lake (formerly the Neuse River), the situation is reversed owing to the softer Triassic rocks in the upstream portion and the harder metamorphic rocks in the lower part. The boundary between these two portions is the Jonesboro fault, very close to NC Highway 50. Consequently, upper Falls Lake is wide, flat and shallow, but lower Falls Lake is narrow, rocky and deeper. 13.2 – The trail crosses an old, overgrown roadbed. 13.5 – Cross a powerline, by the edge of the lake, R. You are leaving Falls Lake proper and will now be traveling along the route of the Eno River, one of the chief sources for the lake. 13.7 – Hop across a small creek (may be dry). 13.9 – Walk through a field and soon turn R into the woods. 14.1 – By the edge of the river, R, cross through another field. 14.3 – Another small creek is crossed. 14.6 – By another trail marker, leave the field and turn slightly R to walk through a clump of woods between 2 fields. 22-I: Here you cross a tiny gully that has been formed as the result of runoff from the field to the left. If the field were woods, this gully would probably not be here. Vegetation, and especially tree leaves and roots, allow rainfall to percolate into the soil. But clearing land allows more to run over the surface downhill. Imagine how much stronger the effect is when the cleared area is paved over. This is the effect of urbanization on our watersheds. The runoff can easily carry pollutants into our streams, in addition to causing more erosion. 14.9 – Walk along a tributary of the Eno River and soon cross the edge of a small pond. You are now traveling through an area of wetlands. 15.4 – Cross the first of several small water runs. 15.8 mi – Reach Red Mill Road, about 1.8 miles north of the Ellerbe Creek crossing. The trail continues to the next section by turning R, heading about 100 ft along the road’s shoulder, then L to cross into a small parking area (‘No Dumping Allowed’ sign) with a signboard.